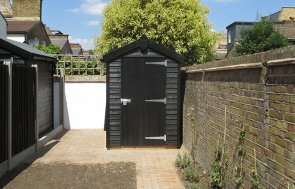 This 1.8 x 3.0m Superior Shed has recently been built for garden storage. It was delivered and installed free of charge, as part of our end-to-end service. Coming from our range of bespoke Garden Sheds, this shed has a pent roof that has been lined with heavy duty felt, making it waterproof. The slope on the roof also helps protect the front from rainfall. The shed's shiplap cladding has been painted in Teak Sikkens Paint, adding another weatherproof layer to the FSC certified® timber. The customer also requested an additional security pack. 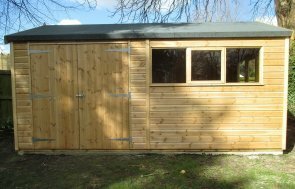 As part of this, the shed's three windows have stainless steel bars, as well as security screws in the door hinges and a heavy duty bolt. We offer a wide range of luxury Garden Buildings, all of which you can view by visiting one of our seven UK National Show Centres. For any queries, you can Request a Callback, Contact Us, or call a member of our team directly on 01760 444229.